Service Untitled» Blog Archive » Is self-service better than live customer service? Is self-service better than live customer service? Assuming there are no waiting lines, would you opt to use a self-service kiosk at the airport to check-in or would you prefer to interact with an airline agent? It could be our own obsession with electronics and “click click” we are so used to doing, or it could be our conscious or even unconscious desire to avoid business relationships. Many of us prefer to use the ATM machine instead of a bank teller because some simple banking tasks are quicker and less hassle than dealing with humans. We don’t even have to be pleasant to a machine. According to a recent article from the Harvard Business Review, customers ultimately don’t want a relationship and prefer the use of machines, but doesn’t the relationship depend on whether a customer has a good or bad result with a machine? 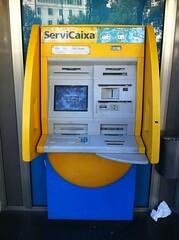 If an ATM accidentally eats up one’s $20 bill, and the customer is forced to speak with a bank representative, has that machine been an effective tool? What about the unfair check charge on a customer’s account? Will an automated service be able to cancel the charge because the customer has never stopped payment on a check and they are a solid depositor? When I go to a store, whether it be Wal-Mart, Publix, or even the bank, I look for the fastest and most efficient way to be done with my purchase. If I am having a problem with merchandise I want to find someone who can help me. I think we have all been the victims of poor customer service; those agents who hate their jobs, have no solutions, and should never have picked up the phone that day. So do those bad experiences rationalize the interpretation that consumers don’t want to talk to businesses? Personally, I think it validates even more the need for exceptional training of only the best customer service representatives a company can afford. It’s definitely a smart investment! I read this with interest. I actually prefer to deal with a person than a machine. I love technology but I want someone to answer my questions and say “Good Morning”. I would love to reference the Harvard Business Review article you mentioned. Here’s a link to the article Lisa. http://hbr.org/2010/07/stop-trying-to-delight-your-customers/ar/1 Ironically the self-service lane I used at Home Depot says “Good Morning.”!